About a year ago, I wrote a post about Nashcon 2015 and about how John Hill was Remembered at Nashcon 2015. This coming Memorial Day weekend, Nashcon 2016 will be occurring. Nashcon continues to be an open gaming convention for miniatures games, board games, card games, and other fun gaming events. Nashcon draws well over 400 gamers every Memorial Day weekend. The admission price is only $35, which gets you into every game, provides you with a hotel discount and brings you in touch with the best gamers in the region. Naschon will prove to yet another fun convention. There is going to be a variety of tournaments and games being run. It should appeal to every gamer out there. Grab your sword General, rally your Standard Bearers and bring your forces to the Mighty Armies National Championships! Pit your Army against some of the greatest armies in all the Kingdoms for Honor and Prizes! Don’t have an Army ready to go? Fear not! There will be some pre-built armies on hand for those can’t raise an Army in time. There will also be awards for most original army and a best in show! That night will also have a few openings for a new Beta Test and possibly a LAST MAN STANDING BATTLE ROYALE! So Grab your Army and join us at NASHCON on May the 28th! Registration begins at Noon! We hope all of you wargamers are going to be able to make it. If you do plan on going and are able to take pictures, please feel free to send them to me at stephaniehill@acrossadeadlyfield.com. I will post them on this tribute blog to John Hill, giving you full credit. I hope you have found this post on Nashcon 2016 to be helpful when getting the information you need as well as finding the cheapest hotel, flight and rental car. Please leave comments below and I will reply shortly. Was so wanting to attend the Nashcon this year, but got a family medical emergency and that needs to be seen to. I am particularly a fan of models, building of miniature airplanes and cars and collecting limited edition toy memorabilia. Would have loved to seen the stuff on show at Nashcon 2016. Thank you for stopping today to read my post on Naschon 2016. It sounds like you might have enjoyed the convention. It occurs every Memorial Day weekend, so perhaps next year you can catch it. Is it for all ages… I can’t actually go, but I was thinking my niece would love this. I live in VA so it would be a drive for me, so if it is for everyone, perhaps next year! To answer your question, the best age for kids to start getting into the hobby is age 12. You can read more about this on my article Parent’s Guide to Understanding Tabletop Wagraming. You can read more on whether this would be a good choice for your niece or not. And, although not as common, girls do sometimes participate in wargaming. Tennessee is not that far from Virginia. I myself grew up in Virginia. 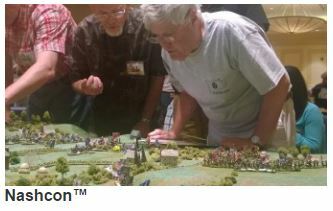 During my younger years as a child, my father facilitated a regular tabletop wargame out of our home, first in Manassas and than later in Falls Church, both cities located in Northern Virginia. Before moving to Virginia, my father ran a hobby shop out of West Lafayette, Indiana. You can read about that in the article John and His Trains. that sounds like great fun! won’t be able to attend this year, unfortunately. Will there be another next year? The HMGS con (Naschon) happens every Memorial Day weekend. I am sure you would have enjoyed it. Thank you Brain for your comment. I am sure you will have fun at the Naschon 2016 convention. Be sure to take pictures and send them to me.